Why can't I turn on the player? The HOLD switch is set to the HOLD position. Slide the HOLD switch to the opposite position. 2: HOLD switch. If HOLD appears on the screen, slide the HOLD switch in the opposite direction of the arrow to cancel the HOLD function. 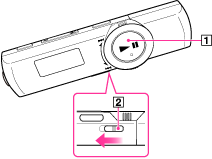 If you press the button immediately after turning off your Walkman, the Walkman does not start due to the shutting down process. Wait for a few seconds, then turn on the power. Charge the battery by connecting your Walkman to a running computer. If you charge the battery and nothing changes, press the RESET button to reset the Walkman. There is not enough free space in the built-in memory. - For details, see the capacity for files and folders on our online manual. - At least 20 MB of free space is necessary to function normally. If you want to check the free space, open My Computer or Computer – WALKMAN, right-click Storage Media to display the menu, and then select Properties.